India is a land of great artistry and talented artisans who have a significant contribution towards ethnic fashion in the form of textile weaving, embroidery and embellishments. 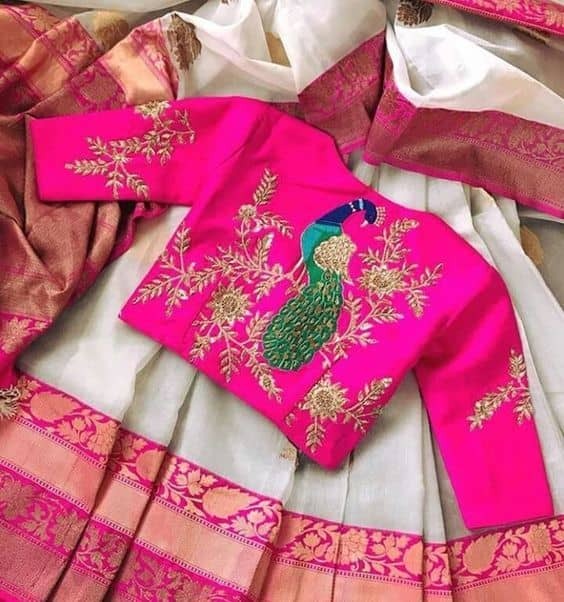 Embroidery stands out amongst these forms of artistry for the painstaking and delicate use of threads of many hues to accentuate Indian ethnic garments. 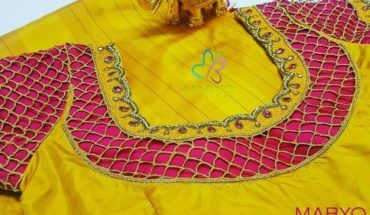 There are various different types of embroidery in the country with varying degrees of popularity and Maggam work or Maggam embroidery is one such popular variation of embroidery. 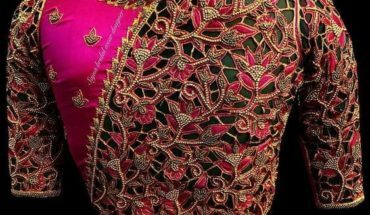 Maggam embroidery is often used to accentuate the blouse that goes with the Indian traditional saree and such is the appeal of this type of embroidery that Maggam blouse designs are highly sought after and often reserved to be worn with festive, wedding and bridal sarees. The nature of definitive Maggam work, when put in words; hardly ascribes to the beauty of Maggam embroidery. 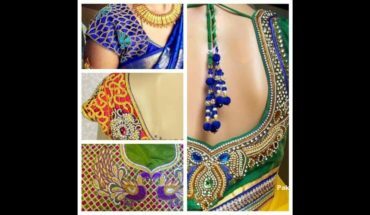 For that; one must present some of the best Maggam work blouse designs and this blog aims to do just that. Scroll down to feast your eyes on stunning Maggam embroidery on blouses of various hues and colors. The peacock is one of the most beautiful birds in the world with its colorful and unique plumage. Not only is this the national bird in India but has also been long admired for its beauty and is often associated with royalty. 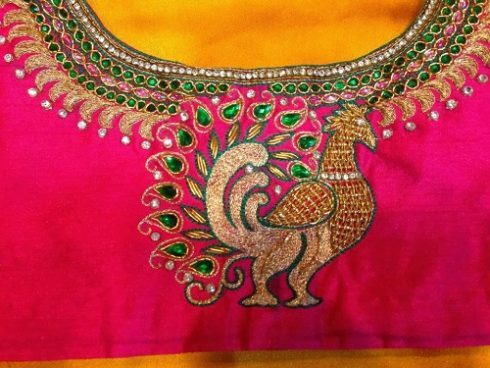 Thus it is quite common for peacock motifs to find their way onto Indian ethnic wear. This Maggam work blouse stands out for its design that prominently features the peacock motif along the neckline. Do not forget to consider it if you are looking for bridal maggam work blouse designs. Often time’s embroidery is just one facet of accentuation for the saree blouse. This blouse is a prominent example of the point being made as it features Maggam embroidery in combination with cutwork to create a truly stunning blouse. Floral motifs feature heavily in women’s wear; western or ethnic, printed or embroidered. This exquisite floral motif Maggam embroidery blouse is a prominent example of the point being made. Considering that floral motifs are often imprinted on women’s wear using exquisite embroidery techniques like Maggam work; it is easy to see why we are not due to get tired of floral garments anytime soon. 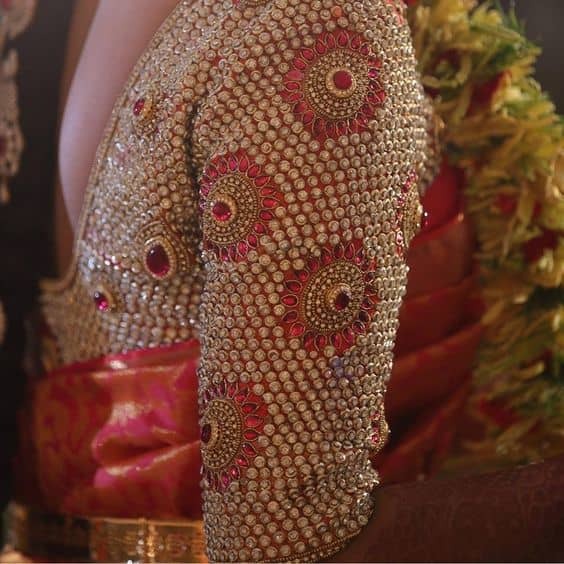 Maggam work is often combined with embellishments to create stunning blouses to be worn with bridal and festive sarees. 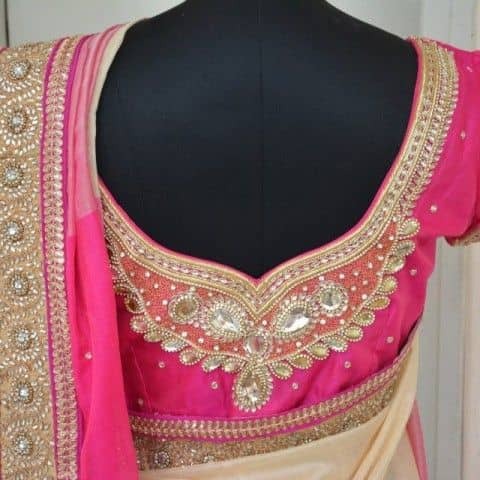 The blouse in the picture above is heavily embroidered with Maggam work in combination with sequins and semi-precious stones to create a blouse that is one of its kinds. This blouse truly flaunts Maggam work embroidery in all its ethnic glory. This is a famous one from the maggam work blouse designs. The lattice motif has been passed on from ancient Indian architecture to Indian ethnic fashion and this motif is definitely here to stay. This Maggam work blouse is testament to this fact as it features delicate lattice designs created with painstaking Maggam embroidery. No doubt, it is the latest Maggam work blouse designs to pick from! 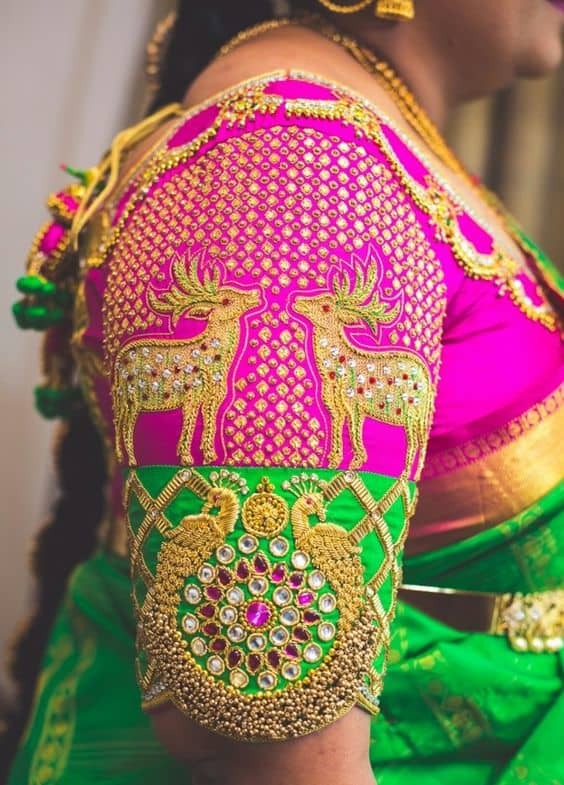 It is apparent that the peacock motif is a strong design trend for ethnic Indian garments and this Maggam work blouse is testament to this fact. This blouse features the peacock in all its glory perched upon the branch of a flowering tree. Intrinsically ethnic; this blouse is the perfect completion of a festive or bridal saree ensemble. Here is another brilliant example of Maggam work combined with semi-precious stones. 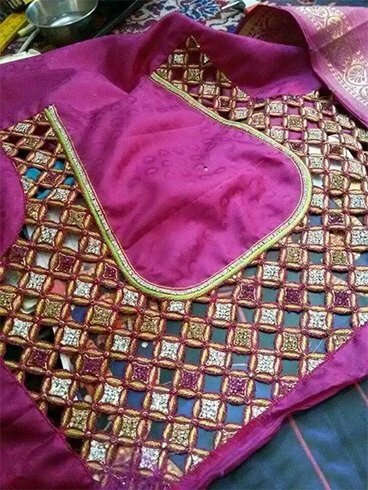 This pink blouse is truly accentuated with gold thread Maggam work that is complimented by tear shaped semi-precious stones. 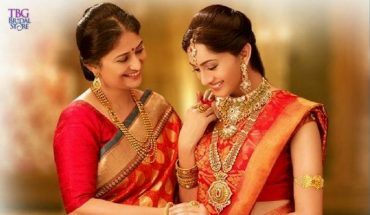 It is easy to see how this makes for the perfect blouse for a bridal saree. Delicate round Maggam work that creates the perfect embroidered polka dot effect for this blouse is combined with Thilagam stones for an upper garment that is worth its weight in gold. This blouse is so exquisite that it is best reserved for bridal wear or festive occasions. 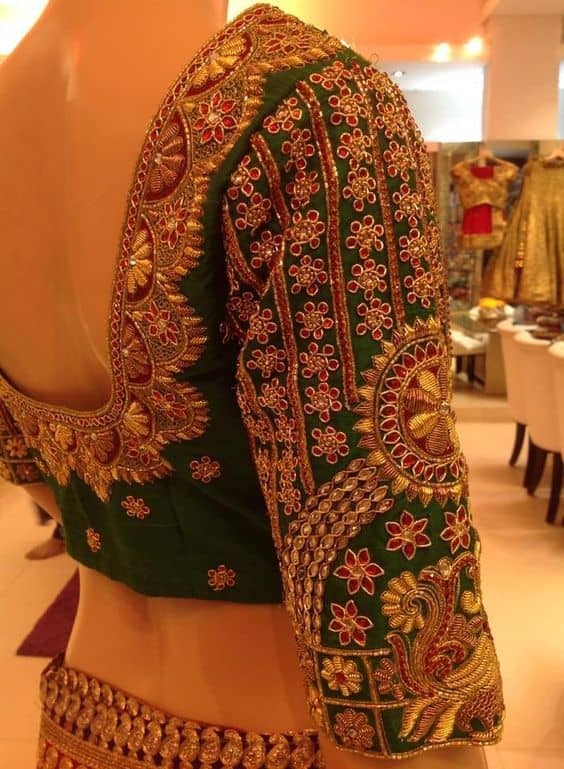 Often Maggam embroidery is limited to the blouse sleeves. The blouse in the picture above is an excellent example. This embroidered sleeve design combines many ethnic motifs like deer and peacocks. 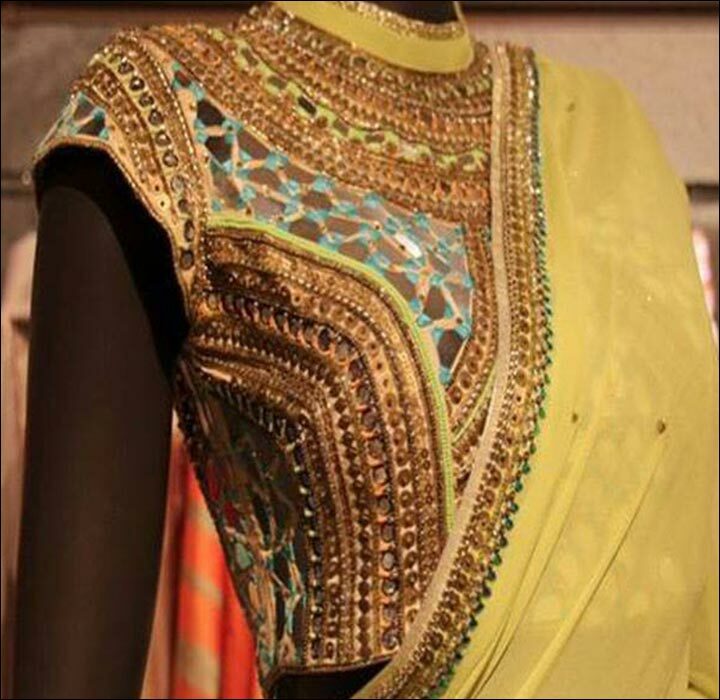 Stonework is also added to further accentuate this exquisite saree blouse. Just like Maggam work is used to accentuate the sleeves and neckline of a blouse, it is also used to accentuate the backline in low-cut blouses. Here is one brilliant example. Make note of the combination of Maggam embroidery with tiny beads for embellishments. This falls under the simple maggam work blouse designs. In conclusion; it is easy to see how Maggam embroidery is a truly stunning form of artistic accentuations for ethnic garments. Maggam work blouses are widely available even though this form of embroidery originates in the south of India. The value of the blouse is directly proportional to the extent and beauty of the Maggam embroidery.